I was browsing the internet the other day, as I am wont to do and I came across the question: if you were alone in a supermarket overnight, and you could do anything without consequence, what would you do? Most of the answers were something along the lines of, eat all the food, run around and play supermarket sweep, and surprisingly, rob the ATMs. But, there was one answer that spoke to me. Someone said they would make a bed of bread. It made me giggle. I can’t say that I’ve ever dreamed of a bed of bread. A field of french fries, definitely, but a bed of bread sounds nice too. 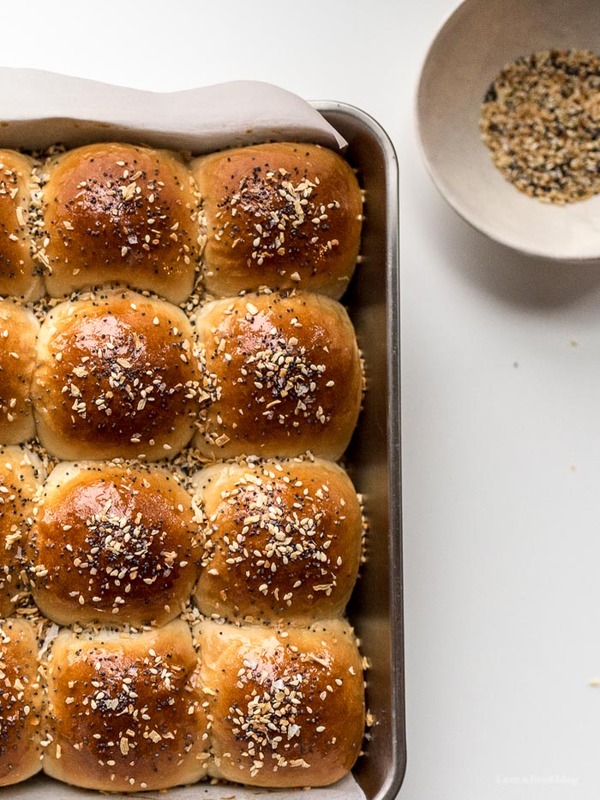 Anyway, if you’ve ever dreamed of a bed of bread, I hope that would consider these everything bagel dinner rolls as a contender. Maybe for a side pillow or something. They’re soft, fluffy and so delicious. 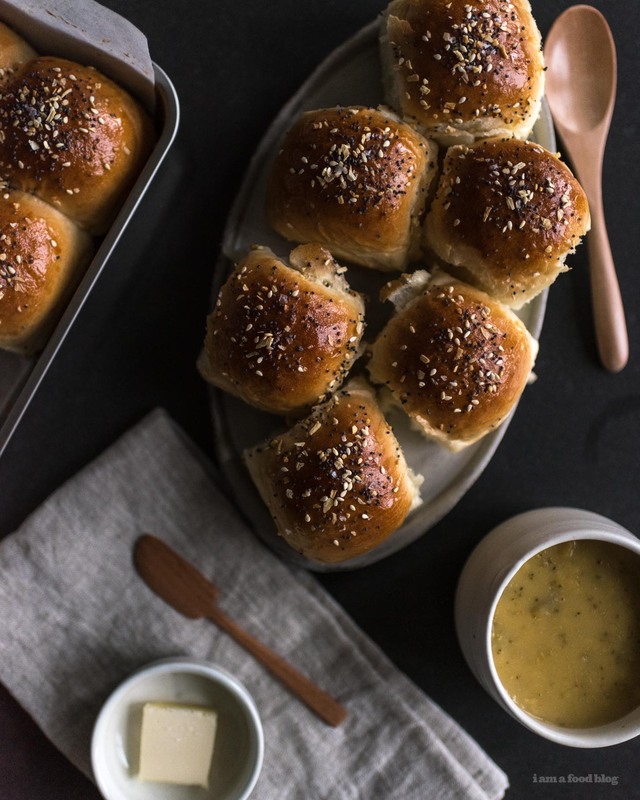 They’re essentially my favorite dinner roll recipe, but with some everything bagel spice on top because I’m in love with everything bagel spice. 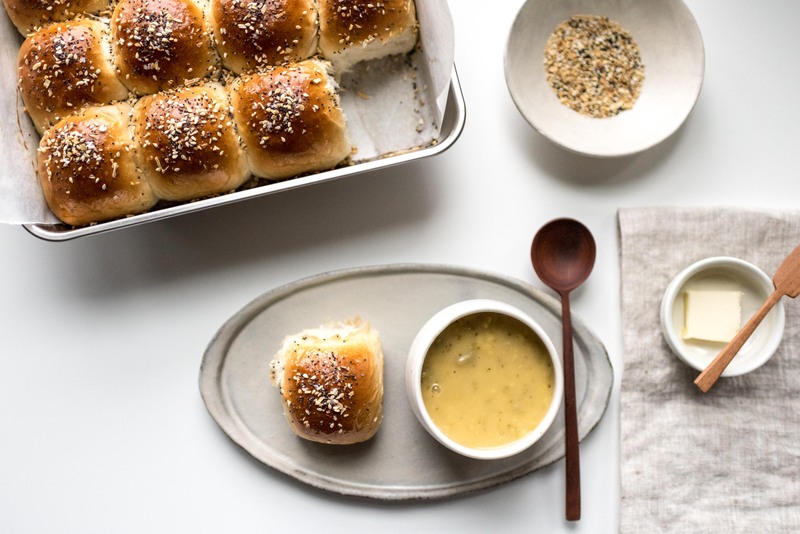 I’ve been eating these rolls non stop, warm and right out of the oven, on their own, made into little breakfast egg sandwiches, sliced and made into mini grilled cheeses. They’re the rolls that keep on giving and I’m just rolling (eye roll, I know) with it. Notes: I often find myself scaling recipes and having things call for 1/2 large egg. I usually whisk a whole egg in a small bowl, then measure out 1 1/2 tablespoons of the whisked egg. Save the other half of the egg for the egg wash.
Sprinkle the yeast onto the warm water and let proof. Meanwhile, in the bowl of your mixer, stir together the flour, sugar and salt. Whisk the egg into the foamy yeast mixture, then add the mix to the dry ingredients. Use a wooden spoon to stir together until everything comes into a ball. Switch to a dough hook and knead on low until the dough pulls away cleanly from the sides. 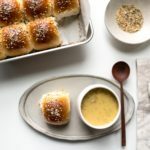 Add the room temperature butter and continue to knead on medium-low, for about 10 minutes, until the dough reaches the windowpane stage – take a piece of dough about the size of a golf ball and stretch it out between your fingers and thumbs. If you can stretch it without the dough breaking and you can see through the stretched dough, you’re good to go. If the dough doesn’t windowpane, knead a bit longer. Transfer the dough to a clean bowl and cover with plastic wrap. Place in a warm spot and let rise until doubled, about 1 hour. Take the dough and tip it out onto a lightly floured surface. Punch down lightly then divide into 9 or 12 equal portions depending on your pan size (either 8×8 inches or . If you want to be precise, use your kitchen scale to see how much your dough weighs, then divide by 9 or 12. 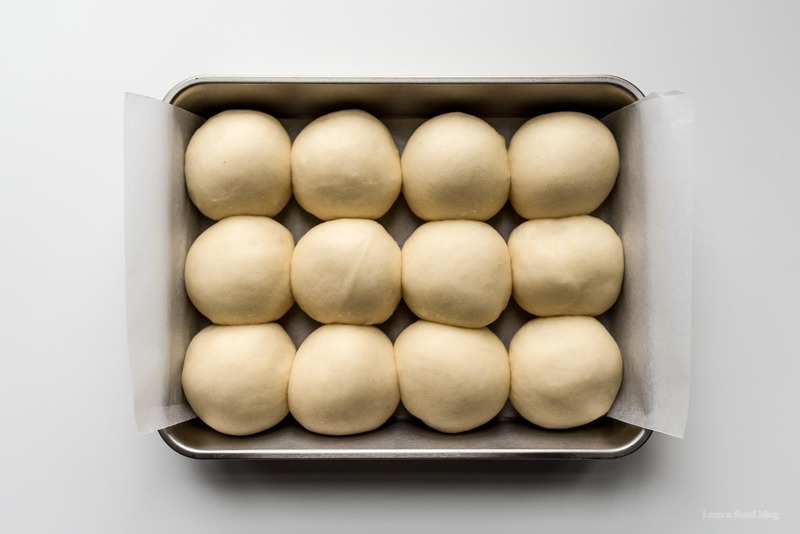 Shape the portions of dough by bring the edges towards the center and tucking into balls. 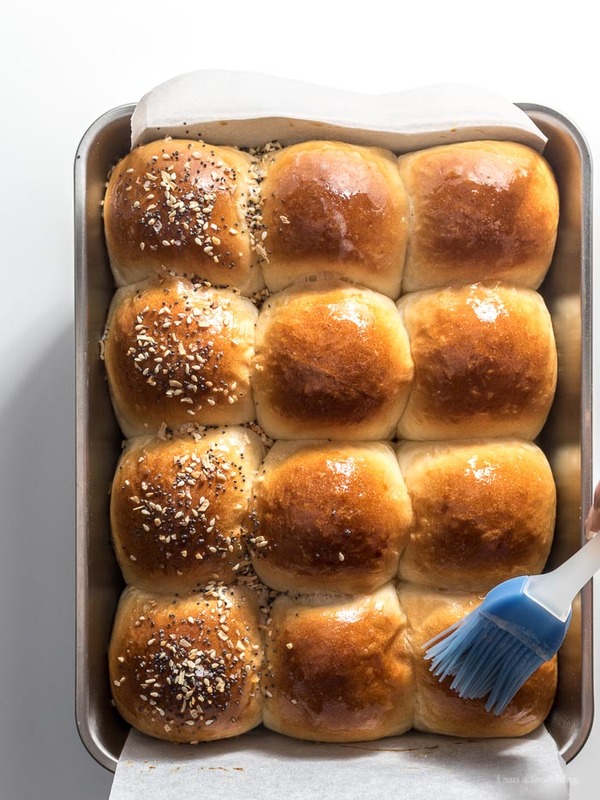 Lightly grease a 8×8 baking pan and place the buns in. 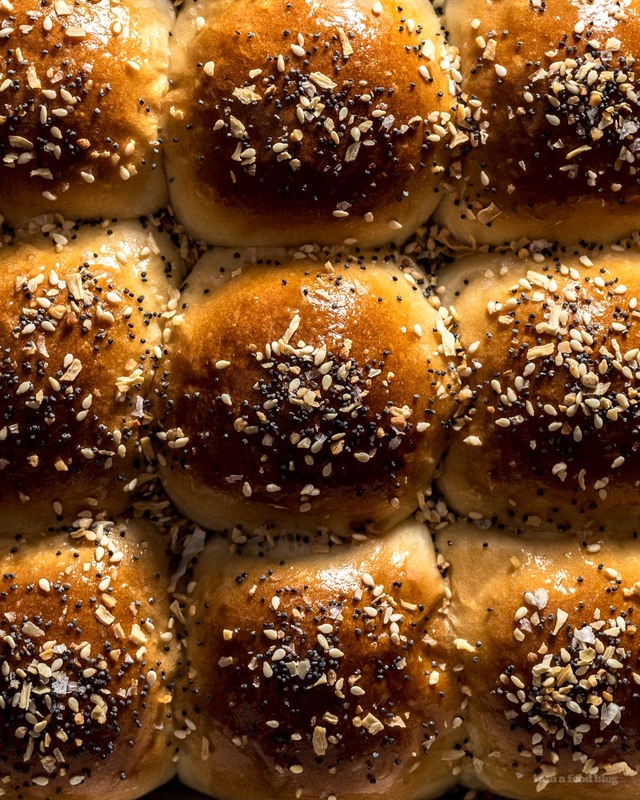 There will be space between the buns, don’t worry, they’ll rise. Cover and let rise in a warm spot for 1 hour. Heat the oven to 356°F. Whisk the remaining 1/2 egg with a teaspoon of water and brush onto the buns. Sprinkled on the everything bagel seasoning. Bake for 15 minutes, or until golden brown. Let cool slightly and enjoy warm or at room temperature. Alternatively, you can put the everything bagel seasoning on after the buns are baked: brush on some melted butter and sprinkle on the everything seasoning. This is what I did because I wanted a little layer of butter on top because I was serving them warm. Girl, these are killing me with craving! Wow they look amazing!